We have more than 25 years of experience in selling and using the AFRON work platforms. Our company is based in the middle of Holland in the vicinity of the city of Gouda. From here, the distribution of the dealer network of all 43 European countries is controlled. 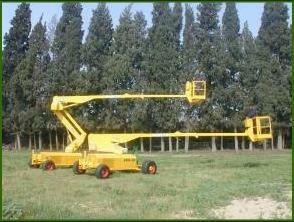 The AFRON man lift was over 35 years ago originally developed in Israel as a fruit-picking machine, a mechanical ladder. The European market developed through the years for pruning street trees in councils. The use of an AFRON to prune with, boosts the production over 500 %!!! In our rental company "WERKLIFT" in Holland we have over 85 AFRON machines in various models available for hire. These are in use by over 800 councils in Holland and Belgium and operated by the local authority personnel; mainly on long-term hire contracts. For the European market only the models AFRON SA-500, AFRON RST 10 and AFRON RST 12 are available for countries where a CE approval is necessary. Due to long-lasting experience ONLY these machines worked out to be the ultimate in tree pruning along lanes and roads in urban vicinity. To summarise: We continue where all other access platforms in this range fail !!! For more details or a demonstration please contact us directly.